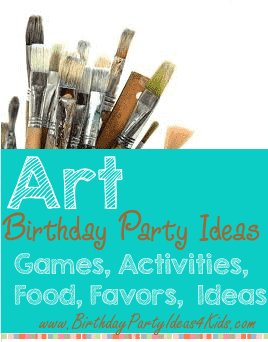 Art birthday party ideas that will help plan and create a party masterpiece. Fun and unique ideas for Art Party games, activities, food, favors and more! An art party for kids brings out the creativity in everyone! Make invitations for an Art Party in black and white coloring book design and attach a crayon so birthday party guests can color in the Art invitation. Have your child color a picture on the front of blank note cards, then send through the printer to add the birthday information on the inside. Attach large sheets of white butcher block paper to cover the table(s) where the children will be sitting. On the white paper scatter pens, pencils, markers and color crayons around the table and ask them to color where they will be sitting. Use empty paint cans to hold flatware. Set out large artist palettes with a different colored candy (skittles or M&M’s work great) in each place on the palette. Use artist palettes for plates. Buy several different packages of solid colors plates, napkins, cups and flatware and mix and match them around the birthday cake table. Tie brightly colored helium balloons on the backs of chairs around the table and tie with several different colors of curling ribbon. Tie brightly colored helium balloons outside on the mailbox. Large crayons (the big plastic Crayola banks), large paint brushes (string mops) and posters. Ask Home Depot for aprons or find inexpensive aprons at the craft store. Use to keep clothes clean and also as a party favor they can decorate and take home. Draw or print out a large poster size clown. Place a large round white circle where his nose is. Assign each party guest a different color paint. Blindfold them and one at a time have them try and paint a nose on the clown in their color with a round sponge brush. The birthday party guest who gets their color nearest to the nose wins. Give each child a small can of play dough. Tell them that they will be sculpting different things that are birthday related … but they only have 1 minute to make their sculpture. Call out a birthday item and have all the kids sculpt that item within 1 minute. Then have them mash their creations into a ball and call out another birthday item. Some fun birthday items for the kids to sculpt are: birthday cake, candle, cupcake, number (age of the birthday child), balloon, ice cream in a bowl, etc. Use our homemade play dough recipes for this fun game! Teach everyone how to draw the hopscotch board and then give them instructions on the game of hopscotch. On canvas paper place a large monogram sticker (first letter of the party guests name) and then have the guests paint over and around the sticker. When dry peel off the sticker to reveal their white monogram. The stickers can be cut from white contact paper. Pin balloons filled with paint on canvases and let the party guests throw darts at the balloons to pop them. Have one large canvas that the birthday child can hang up in their room after the Art party or use smaller canvases and let each party guest take their masterpiece home as a party favor after the party. Set out several containers filled with sidewalk chalk on a paved surface and let the party guests make their own sidewalk art. For fun you can also set out spray bottles filled with water (for erasing) and items to trace around. See the sidewalk chalk ideas page with over 30 ideas for games and activities. Hang up large poster boards on fences or walls. Give each poster station a set of watercolors, a brush, small container of water and paintbrushes. Ask your local paint or home improvement store for empty paint cans. Let party guests decorate the outside with paint pens or stickers. Use these as goody bags to hold party favors after the Art party. Choose a famous painting and make a color copy of it. Cut the copy into different pieces and label them 1, 2, 3, 4 ... etc. on the back. Buy several canvases and assign each canvas a number. Give party guests one piece of the masterpiece art copy and a canvas. Ask them to paint their piece of canvas to match the smaller copy piece.. When they are done put the pieces together and show them the finished masterpiece. Make colorful art bracelets from beads. Guests can take them home as a party favor. Decorate picture frames with foam stickers, paint and stick on jewels. Cover tables with large sheets of butcher paper. Set out different colors of finger paints, brushes and sponges and let them experiment with the finger paints. Use our sidewalk chalk ideas page to give little artists some ideas on what to draw with sidewalk chalk. Have kids work on one large art project with the chalk or give them each a large section of sidewalk or driveway. Set up a cupcake decorating station and the kids can decorate their own cupcakes. Supply lots of different kinds of frostings, sprinkles and candies. Give each guest a small plastic art pallet and let them fill the holes where the paint goes with different toppings. For a fun Art Party experiment mix Sprite or water with a little food coloring in the primary colors of red, yellow and blue in 3 separate pitchers. With these colors you can mix drinks for party guests in any color of the rainbow. Green = yellow + blue, Orange = red + yellow, Purple = blue + red. on a cupcake stand. Let the kids make food sculptures with baby carrots, cheeses, celery, olives, etc. - held together with toothpicks. small pads of drawing paper, markers or crayons. Empty paint cans the kids can decorate and turn into a goodie bag. Buckets or containers that will hold art supplies. Apron with pockets - fill pockets with art supplies and fun art shaped candy.